Preheat pizza stone by placing in cold barbecue and setting barbecue by turning the two outside burners to HIGH and leaving the middle burners turned off, allowing it to heat up for at least 10 minutes. Dough (make in advance or while pizza stone is preheating): Dissolve the yeast in lukewarm water with 2 teaspoons sugar. Add the flour, olive oil and salt and knead until elastic. Let rest 10 minutes before rolling. No rising is required. Prepare pizza dough by gently kneading and stretching thawed dough into desired shape, on a wooden pizza board or rimless baking tray, which has been liberally dusted with corn meal. 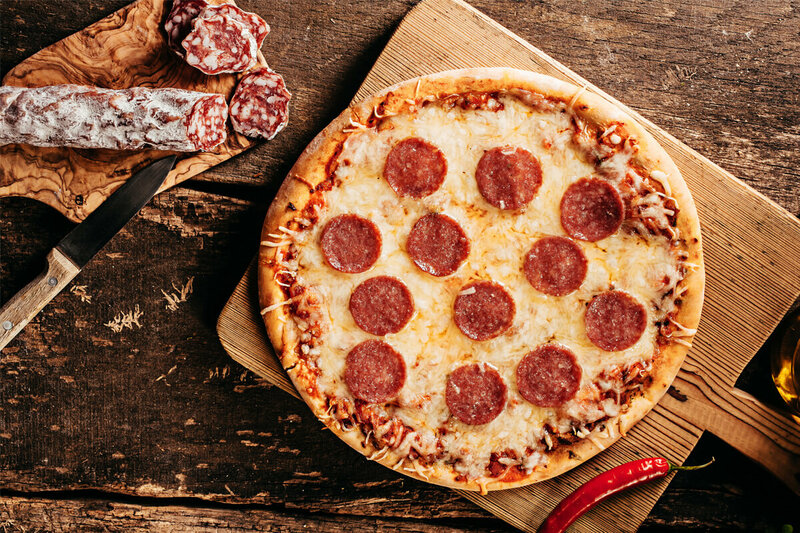 Spread tomato paste evenly over surface of dough and arrange pepperoni slices over sauce. Sprinkle grated cheeses evenly on top. If using, half fill smoker box with Hickory Wood Chips. Remove the grill on the far right using a grid lifter and place smoker box on top of the Flav-R-Waves, then replace grill. This gives authentic wood-fired pizza flavour. You can also place the smoker box on top of the grill if easier. Sprinkle some flour on the pizza peel to stop sticking and place your prepared pizza on top. Slide the pizza onto the hot pizza stone using a quick movement. Reduce heat to MEDIUM (200°C) and close the grill lid. Cook for 12–15 minutes, or until dough is crispy.